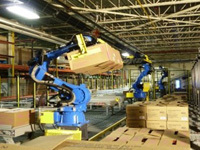 The Robotic Solutions offers cutting-edge advances in robot and vision technology to provide substantial benefits in material handling and productivity. 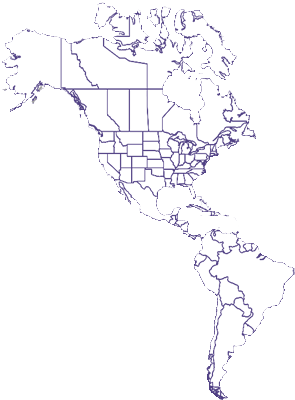 One such innovation is designed for the shipping and receiving area and is unique, award winning, and patented. Featured here is a revolutionary robotic truck loading system which is capable of autonomously fluid loading and unloading product, in and out of trailers, both safely and economically. AS/RS Robotic Buffer is an ideal solution for applications where an intermediate buffer is required. Volume imbalance between processes create additional labor costs, and floor space for staging product comes at a premium. Where other conventional approaches to product buffering are cost or space prohibitive, this offers proven technology in an innovative arrangement. RTU - Bulk is a self-guided, autonomous robotic truck loading and unloading system. The RTU-bulk is designed to deliver cost savings to facilities that load cartons or pallets from a manufactuing or product line. RTU bulk has two modes of operation, Loading and Unloading. 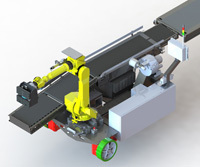 RTU - Standard is a self-guided, autonomous robotic truck and shipping container unloader. The RTU utilizes advanced perception technology that allows it to sense and acquire product that has been floor loaded within a semi-truck trailers or ocean freight container. Wynright's truck unloading technology is ideal for rectangular boxes, bales, and even tires. The system has the capability to unload product automatically, adjusting its position by sensing the sidewalls, floor and product as it unloads and moves forward to completely unload the container. 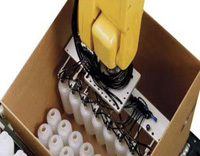 Our robotic depallitization products are designed to eliminate injuries, reduce product damage and increase rates. Designed to handle a wide variety of products, these depalletization units can pick individual cases or full layers. With Pick Rates in excess of 100 Parts/Minute, our robotic units are designed for high speed packaging and palletizing applications. Its advanced tooling can handle a variety of product sizes and shapes. These systems reduce costs, and deliver exceptional reliability and uptime. We offer a wide range of palletizing options from small cost effective single SKU palletizing cells, to high-speed cells palletizing full layers of 4 SKUs simultaneously. 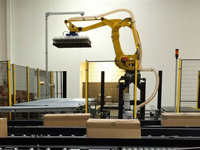 We have palletizing units for fixed or linear applications that are capable of handling multiple product types.